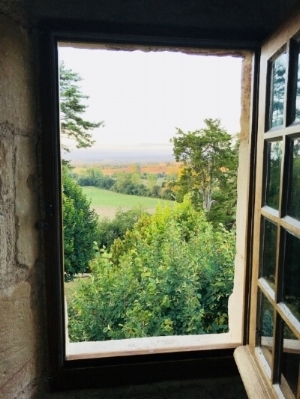 I shared in my last post about the magical time I had traveling in France. In this post I wanted to share the impetus for me going to France to begin with and the deep healing that occurred. I gave this trip as a gift to my little girl within. Forewarning: very in-depth and personal information here. I had always had a fascination with the South of France and particularly the Languedoc region in the southwest mainly because of my interest in Mary Magdalene and the strong sense of her presence in the area. The Cathars, a large spiritual group that was loosely connected to Christianity and the target of the Albigensian Crusades by the Catholic Church for mass religious genocide from 1209 to 1229, has held fascination for me as well. I have always felt my soul has history there. When I saw that there was going to be a workshop in the Albi area, I knew it was the perfect opportunity for me to get my feet wet in the country that was first on my list for international travel. The workshop was called “Be the Icon: An Electric Ascension”. It was organized and developed by style master Eyenie Shultz of technicolorpriestess.com. When I read the description of the workshop taking place everything inside of me stood up and said, “YOU NEED TO BE THERE!” I knew it was going to be just the thing I needed to help me transform completely out of the old, cramped energy of my past and the outdated vision I had of myself in order to move to the next level I know is possible for me. The idea of learning to radiate my authenticity and soul essence through the clothes I choose to wear was a completely new concept for me and one I was ready to learn. One of the other few times I have had such a demand from my soul was when I was 23 and and searching for a way to heal from my meth addiction. I knew I was going to die young if I didn’t change my ways and desperately wanted to stop. I saw an add in the back of the Noetic Sciences newsletter I used to get for a vision quest being held in Death Valley during my 24th birthday. Again, everything inside me stood up and said, “YOU NEED TO BE THERE!” It was a magically transformative and healing time for me, so I know to listen to that voice when it speaks up. A little backstory. I was scared growing up. When I was around 12 years old I thought I had to be a tough girl in order to survive. Don’t show your vulnerability. Don’t show your softness. I thought being feminine meant being weak and taken advantage of by men. I also thought I had to give men anything they wanted and had no right to say, “No.” I didn’t know at the time where this idea came from, but the clothes I chose to wear in my tweens and teens vacillated between overtly risqué or hiding everything with flannels, jeans and leather jackets. I went from metal-head, to dead-head, to biker chick within 4 or 5 years as I was trying on different identities, never knowing where I truly fit. And feeling like I fit nowhere. I had a massive inferiority complex and had been suicidal from age 11. I had no idea why. I thought I was just damaged goods. Coinciding with my various identity crises growing up, I began my descent into addiction. I started smoking cigarettes when I was 11. Around 12 or 13 I started drinking and smoking pot. By 14 I was drinking whiskey, vodka, and anything else I could get my hands on. I also started doing acid at 14 and did that fervently until I was 17 and had a bad trip. I decided it was time to find a new drug and started doing meth and cocaine instead. Between the ages of 19 and 24 I did meth just about ever day. What I couldn’t understand growing up was, Why? Why was I acting like this? Why was I hurting others and hurting myself? I had an extreme self-loathing and I had no idea WHY. Oddly enough, when I was 12 and beginning the descent into my own personal hell, I had developed a keen interest in all things natural and spiritual. I had some experiences as a child that showed me there was more to the world than what could be seen with the naked eye and I was hungry for understanding my experiences. I started on my quest to learn everything I could about Gnosticism, Taoism, Buddhism, Hinduism, and Indigenous cultures from around the world as well as natural healing and alternative medicine. As my addictions pulled me towards death, my spirituality pulled me back towards life. 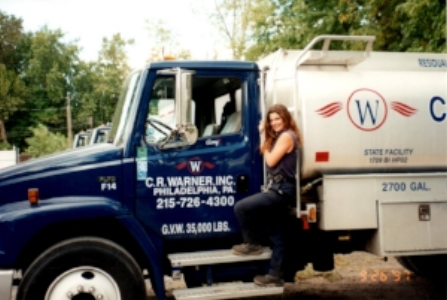 When I got clean and became a truck driver for a waste oil company out of Philadelphia in my mid 20’s, I had a uniform to wear so I didn’t have to think too much about the clothes I wore. That was a relief, but then my identity got completely wrapped up in being a truck driver. I cursed a lot and drank a lot because I thought that’s what guys did, and I wanted to be the best guy I could be. Lucky for me, too, they had random drug testing so I had to get clean and keep clean in order to keep my job. During the 5 years I made my living as a truck driver I was able to begin the process of healing my soul from all of the bad choices I made growing up. I could afford to try all of the various alternative and spiritual healing modalities I was interested in and incorporate the most effective ones into my life. Chi Gung, Celtic Shamanism, Rebirthing, Neuro Linguistic Programming, Biofeedback, meditation, massage, Network Chiropractic, and a host of other healing practices contributed to helping me get clearer, stronger, and farther away from addiction. I finally decided to quit truck driving in 1999 when I was 28 and move out west to become a Natural Therapeutics Specialist and bodyworker. Perhaps it was all of the bodywork I received in massage school that contributed to the release of memories from my childhood, or my soul was just ready to reveal it’s secrets, but in my early 30’s I found out the answer to why I felt so damaged growing up. Memories of being molested by a friend of the family started bubbling up fast and furious along with all of the rage, guilt and shame that had surrounded and suppressed them. In a way it was a relief because I finally had the answer to my question, but then began the decade long and arduous process of consciously healing my soul from the fallout of childhood sexual abuse. So back to the workshop and fashion. Most of my life I thought fashion and style were frivolous and beneath my lofty spiritual and healing goals. I was wrong. Indeed, fashion-like anything else I suppose-is a tool that can be used to one’s detriment or benefit. If its purely ego driven then superficiality and making choices based on needing outside validation will result. However, if soul driven the result will be radiating the truth and authenticity of who you truly are, your “Style.Essence” as Eyenie calls it. Tapping into that soul essence allows you to choose clothing that aligns to the true radiance, beauty, and joy of your unique spirit and expression, rather that what you think you should wear by others’ standards. This was a radical, new idea to me! Over the years of healing the fractures in my soul, I began to reclaim my sense of femininity and reintegrate the awesome power of the Divine Feminine back into my life. Reclaiming my sense of self-worth, esteem, and regard. I learned to soften. Open. Be vulnerable and allow myself to connect emotionally with others where before there was armor. This workshop helped me energetically release the old, residual, stale programming that was keeping me small and held back in many ways. I was able to uncover a true sense of confidence and softness that I had never experienced before. Learning about my inherent softness underneath the tough exterior I developed as a protection mechanism growing up, allowed me to drop away the old armor and embrace the more feminine qualities I got used to hiding. Now, at 47, I finally have the peace of mind of being comfortable in my own skin. And I know what to wear on top of it. The “Iconic” experience allowed me to take the limiters off of my life and step into the person I've always dreamed myself to be: A big, powerful lighthouse of a woman who is isn't afraid to step up and shine with all of her might. Tuning into my Style.Essence and learning how to emit that through the clothes I choose to wear on a daily basis is like tapping into my superhero powers and showing people my true colors. I feel that it magnetizes me to the truth, pure love, and beauty of others, as well. Being ICONIC, to me, means being the biggest and brightest person I came here to be, with no apologies and all the courage I can muster to speak from the depths of my being out loud and be an agent for positive change in our world. The women I met will stay in my heart forever and I see them as lifelong friends now. We will be a support system for each other as we keep climbing higher and deeper into the magnificence of who we are and radiate each other's light back to one another. In this world so often people want to tear others down as they get bigger and brighter. We will hold the mirror of love and a powerful deep beauty as we grow into our biggest life. I wish to hold that mirror for you, too, Beloved. You are powerful. Your are beautiful. You are bright and strong. Don’t dim your light for anybody and shine for all the world to see. The world needs the unique gifts only you can give. Whether it’s making the most awesome pumpkin pie, holding your children in love and creating a safe environment for them to blossom, creating the next big invention or video that goes viral, or anything else you feel drawn to express, be unapologetically and authentically you.